Having a little one can make wearing jewelry difficult, because of the constant worry of them being able to break the necklace or bracelet. Although I can’t blame her for wanting to look at the beautiful pieces I received from American Caliber. They combine spent bullets with a feminine touch. Making a tasteful piece of jewelry to wear on any occasion. The bead pendant bullet necklace with a 9mm bullet featuring a Lt Amethyst Swarovski Crystal is a necklace that I love. I was able to choose the crystal myself and even the chain length. Now I have a piece of jewelry that is stylish and combines my love of pistols and by daughter’s birth stone. 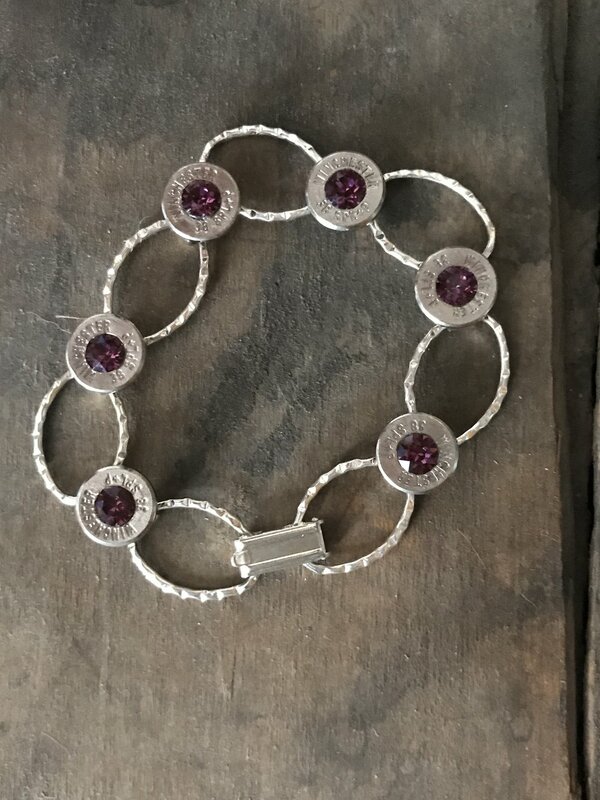 I was never a fan of bracelets until I received the hammered oval bullet bracelet with 38spl bullets with Amethyst Swarovski Crystal. The Silver Plated appearance is a beautiful and elegant touch. I have smaller wrists and the 6 bullet standard size fit perfect. The clasp I never had a problem closing or coming undone especially when carrying my daughter or having her pull on it. Both pieces I was extremely happy with. American caliber bullet jewelry makes for a great gift or even a way to treat yourself. Being made in the USA and personalized in 3-5 business days you can’t go wrong. I look forward to my future purchases with a top notch company. CONNECT WITH HER ON FACEBOOK, TWITTER AND INSTAGRAM! ReelCamo Girl is a lifestyle brand focused on ladies who love the outdoors.There is a growing need for a place for women to share their outdoor experiences, as well as an interest in clean eating and self-sufficiency. Through our website and social media networks, we offer a safe place where the ladies can share their pictures, stories, wild game and fish recipes, and news articles about conservation and hunting perspectives. ReelCamo girls are strong, capable, kind, compassionate, nature & country-loving individuals. We encourage responsible and ethical hunting. We care about the land and wildlife management and about long term sustainability. We hunt, fish, dive, shoot and hike…for peace of mind, happiness, pure clean protein & connection to the outdoors. ReelCamoGirls can shoot a gun, draw a bow, track an animal, get CAMOed up, bait a hook, clean a fish and still be feminine. Come Follow us on Facebook, Instagram & Twitter! Love the outdoor life, Be a ReelCamo Girl!